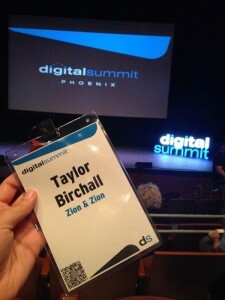 Digital Summit Phoenix focuses on educating marketing professionals on premier digital marketing strategies by bringing together experts from a variety of different companies and industries. Ben Holland, Associate Director of SEO at Zion & Zion, and Zion & Zion Associate Content Developers Taylor Birchall and Patty DiMaggio attended the national conference which was held at the Scottsdale Center for the Performing Arts. 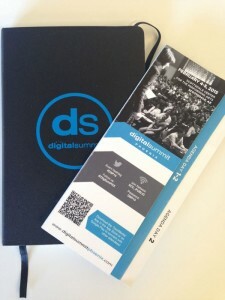 Seeing the Digital Summit Conference as an opportunity to learn about curating more educational content, making connections with other industry experts, and expanding our knowledge about the current digital economy, the decision for the three of us to attend came easily. The Digital Summit Conference consisted of a two day agenda: the first day offered intensive pre-conference workshops and the second day was the main conference, full of vendors and expert, industry speakers. All registered attendees had the option to choose one of the three 4-hour long workshops, each workshop focusing on a different aspect of digital marketing. Our Associate SEO Director, Ben Holland, writes about his experience while at the Advanced Search & SEO Strategies Workshop. This workshop was the best thing I went to during the entire summit. This was an in-depth look into technical SEO, including how to perform a forensic SEO audit and content strategy. Mike was very knowledgeable and provided us with insights and action items we could take with us back to the workplace. I really enjoyed this aspect of his presentation; key takeaways are what I look for in presentations and this was one of the few sessions that had those. Alan’s presentation was very technical and went deep into how to look for SEO issues. His presentation was highly detailed and went over most peoples’ heads. He outlined a couple tools he personally uses, as well as the process he goes through. When performing a content audit, check the readability of all pages. Quickly get pages into Google’s index at a parameter to the URL, so it pings the search engines. Create a customer journey by creating valuable content for each step within the journey. Associate Content Developer, Patty DiMaggio writes about her experience during the Content Marketing Strategies & Implementation Workshop. Arnie Kuenn is a knowledgeable SEO, speaker, and author who recently came out with the book Content Marketing Works. He gave a couple of dramatic, real-life examples that show that content marketing really does work. One example was of an appliance store called Yale. Business was slow until the owner learned about content marketing and met with employees about implementing it into the business. Instead of waiting for people to walk through the door, they decided to create content from all of the questions the sales team received from customers. They started consistently posting articles to the company blog, and the investment paid off. Website traffic went from 40,000 to over 150,000 annually and revenue rose 40%, after starting their content marketing program. Using content marketing really turned this business around, and it can work for any business that knows how to use it. To generate new content ideas, think of questions customers may be asking regarding a company’s products/services, then google the question and see if anyone has answered it yet. If the answer is no, this means one thing: opportunity! Help a company’s content get found on the search engines by optimizing each blog post for SEO: images should always have a description, H tags should tell bots what to expect on the page, meta descriptions and title tags should be unique to each page/post, etc. Measure success by looking at how many people visited the company’s website this month vs. last, how many viewed a particular post, etc. to gauge what content is most interesting to readers. The full day conference on day two was an opportunity for networking and attending numerous professional speakers’ presentations that covered a wide range of topics from user experience (UX), content marketing, search engine optimization (SEO), campaign strategy, analytics and more. Three speakers presented on three separate stages simultaneously throughout the conference, providing fresh information and a chance to move around every 30 minutes. Speakers were fully prepped and delivered a presentation filled with valuable information on how we, as an agency, can stay up-to-date in today’s rapidly changing, digital economy. This was a well-done presentation by one of the leads at Microsoft. He tied his presentation into different quotes and videos of Bruce Lee which was a nice touch. He spoke about major trends and topics and did not dive into specifics deeply. It was a great presentation and gave an excellent overview of the subject matter. Understand your users and customers. Do your research, discard what’s not useful, and then add your uniqueness. Strip away unnecessary elements and focus on the task at hand. UX started years ago: Disney, WW1 Cockpit, Bruce Lee. Know the context that the user has and what they are looking for or need. Use a “flat” aka simple design. Do usability testing on real users. Failure is good! You learn from your mistakes. Users are not objective enough to know what they want. Set up a “concept lab”: create content from ideas generated in meetings. “Show” instead of “tell” through videos. This was a roundtable discussion where the three professionals talked about SEO and social media. Tori and Mike had some really good insights on how the two coincide. Tori was exceptional at explaining how they (U-Haul) use social media to interact locally. Use pay with a tweet to download something so you can increase social engagement. Guest blog on popular sites that drive people to download a piece of content from your site. Share content on social media multiple times, even months after it has been posted. Olapic –Places images from social media on your site. Chuet –Places images from social media on your site. Sprinklr –A social media management tool. The presentation started off with a few facts, such as how 57% of the buying process happens before brand engagement in B2B, and how buyers tend to use multiple channels to make a purchase decision. Social Strategist: struggle with deep analytics. Digital Pacesetters: get insights from analytics, such as ROI and brand recognition. Target market: is your marketing focused on it? Re-focus and don’t stray, understand key performance indicators (KPI’s), ask what you can do to engage more prospects. Engagement: are you capturing right behaviors? Actions > Words, explicit vs. implicit aka manual vs. automatic. Identify areas for improvement (ex: lists, subject lines, offers). Are customers getting an effective/engaging experience on their mobile device with your marketing plan? Mobile email open rates have increased 400% since 2011. People should not have to pinch the smartphone screen or squint to be able to read your email! Learn from others and determine what is and is not working for your business. Think mobile first: assume content is viewed on a mobile device first rather than on a desktop. Make short message service (SMS) a part of the conversation. Social: are you using it effectively? Leverage #s (hashtags) wherever possible. Find your market and focus on it. Reengagement campaigns work (ex: “we miss you” or “come back and visit us”). 53% of emails are opened on mobile. SMS has better results than email, because it is perceived as more personal. Get email sign ups on Facebook. Page load time is too long. Title tag is most important and should be around 55 characters in length. Upasna uses the scientific method to test and refine her strategies. She gave us a step-by-step example of how this method can be used with great results. Conversion: organic traffic, local search success (key). Brand + unbranded keyword + location = Search Term. Where is the consumer coming from? Use city, state, and zip. Separate page for multiple locations. UX strategist are always trying to solve new problems. Where is User Experience (UX) going? No longer is it acceptable to just throw something out there. Everyone has the basics down! Expectations of users are higher. User’s expectations of how things should work and perform are higher. It’s our job to align tasks with the user’s expectations. This was a favorite presenter for most of us. Jason Miller had great energy and gave us lessons we could leave with and apply directly to our workflow at the agency. He discussed his success with content marketing at Marketo and LinkedIn. His presentation was mixed with lyrics and images from rock groups in a hilarious way. LinkedIn content pages get seven times more traffic than jobs pages. Launch content like you would launch a product and support the launch with social media. All you need is one home run a quarter.